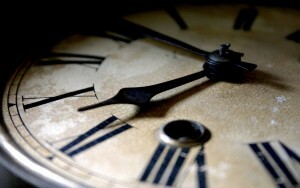 Time flies, time is money, time is a wise counsellor, time is relative, time is… very hard to define. Paraphrasing St Augustine I can say that I know what time is if no one asks me, but if I try to explain it I simply do not know. It seems to be very natural to acknowledge the passing of time, however when we take a moment to think about its meaning, we quickly find ourselves with a few problems. We start by arguing that time can be defined by the interval between two successive events and thus we need a ruler to measure that interval. This is indeed a quest that us humans have pursued since the dawn of civilisation; it is very easy to see how the definition of day comes about: it is the interval between two successive sunrises. Once we have this in place a lot follows effortlessly: on the one hand we can start taking smaller intervals and define hours, minutes, seconds, and on the other, it is now possible to refer to events taking place in the past, the present and even the future. The ordering of these three concepts is intuitive as time flows from the past to the future, and we even see it manifested in the objects around us. We can imagine that we go to a museum where a film installation is being shown. The film starts with a large red stain in an otherwise immaculately white carpet. The camera spans and we see some pieces of glass strangely being attracted to each other while the red stain starts to shrink. The next thing we see is a wine glass appear before our eyes and wine droplets jump into it as if by magic. It is immediately obvious that the film was played in reverse as there seems to be a natural “forward direction”. This directionality is often referred to as the arrow of time and whenever it is discussed the subject of causality arises, and even time travel. When I mention causality I am referring to the relationship between causes and effects; in the case of the film I used as an example, the cause of the spill is shown to us as artist hits the wine glass. When the film is shown in reverse, we tangibly notice that there is something missing: the glass cannot “unbreak” out of its own accord. What does physics have to say about this? If we were to analyse the film using the laws of motion described by Newton, we would find that there is no difference between the forward and backward directions. In other words, time reversal is not prohibited anywhere in Newtonian mechanics. This means that, given a present state under specific conditions, we are therefore able to predict the future, but also retrodict the past, as there is no distinction between the two. This sounds surprising as this sort of thing does not happen in our daily lives. Scientists have come up with their own versions of the wine glass film described above. In one case, they have taken two particles of light, known as photons, with certain energies and mashed them together; after the collision they observed a pion and a deuteron as a result of the collision. Do not be too concerned about what these two new particles are, this will not affect the discussion. When the film is reversed, it shows a pion and a deuteron colliding and producing as a result two photons. This new experiment has been realised and lo and behold the physicists observed the generation of the two photons as predicted, giving them a confirmation that the laws that govern these phenomena do not change when time is reversed. As you may have noticed, we have blatantly ignored the present, and this is because we think of it as a transitory state between the past and the future. In other words, the past is gone while the future has not arrived, and the ephemeral present expires as soon as we try thinking of it. From this point of view, the result of these experiments seems to indicate that the arrow of time is embedded in our perception. It has been argued that the arrow of time is a psychological effect, and that this feeling that time flows mercilessly from the past to the future is all subjective. Let us take these arguments a step further, if indeed there is no difference between past and future, then there is nothing stopping us from travelling to the future (as we imminently do) or to the past (as we clearly are not). Believe it or not, but physics has something to tell us about this. I mentioned above that time reversal is allowed by Newtonian mechanics, so why can we not put together again the wine glass by time reversing the process, rather than supergluing the broken pieces? The answer is not in the realm of mechanics, but in that of thermodynamics, in other words the study of how energy converts between heat and other forms of energy. In that manner, physicists also talk about a thermodynamic arrow of time, in the sense that a given physical system invariably becomes ever more disordered, and since disorder is therefore important we quantify it with a quantity called entropy. 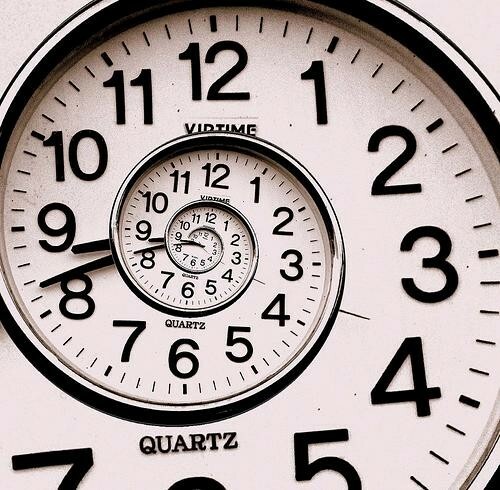 This rule that tells us that entropy increases with time is known as the second law of thermodynamics. Following this line of thought, we are not allowed to fix our broken wine glass by running time backwards because it would imply going from a more disordered state to a more ordered one without using any extra energy, and so travelling to the past is not an easy task to achieve. What about travelling to the future, or in the direction pointed by entropy? Well, in that case there is certainly nothing that stops us in our tracks. In fact, as I pointed out earlier on, we are already travelling to the future, and we do that at a pace of sixty minutes an hour. However, if we wanted to travel to the future at a different rate, Einstein’s theory of relativity gives us a recipe to achieve this. In the so-called special theory of relativity the world has four dimensions: the usual three space dimensions that we know and love, i.e.. length, width and height; and one dimension that is related to time. In other words, when you walk from one place to another in the gallery where the wine glass video is being shown, you automatically change your position on the time coordinate, even if you don’t notice. Einstein tells us that if we were to travel at the speed of light, time expands from the perspective of a stationary observer, whereas space contracts from the point of view of the moving person. This brings into question the notion of simultaneity, as two events that seem to happen at the same time for the stationary person, could in principle happen at different times from the point of view of the moving person. It is fascinating to compare Einstein’s efforts to unravel the secrets of simultaneity in time, with Picasso’s cubism to depict simultaneity in space. The effect of time dilation has been experimentally confirmed with very precise caesium clocks. Unfortunately, it is completely outside of human experience, because we have not yet devised a way of travelling at speeds where relativistic effects become noticeable. Even if we were to spend our entire lives in a plane that moves at supersonic speed, we would barely win a second over our contemporaries on the ground. So, time travel as presented to us in sci-fi films is not yet possible but that has not stopped us from imagining its consequences. As for the definition of time, I am sure that there are many other things that can be said on the subject. Unfortunately, time is a merciless master, and that is all the time and space I have for now.